It’s the year 586, and a famer named Chozaemon is climbing a mountain ridge. He looks north from top of a tree and finds a wide, beautiful plain between two mountains where no human has so far set foot. A beautiful river is flowing. There are also various wild animals. He is so pleased he names it “Onomi”. [o] meaning [big, 大], [no] meaning [field, 野] and [mi] meaning [look, 見]. All these years later, his find gives us many good things. “It’s a place with great natural beauty and people who have warm hearts,” says a policeman who started working in Onomi police substation this spring. Onomi village is located in the Takaoka District of Kochi, along the Shimanto River “the last clear stream in Japan”. It is a place full of natural beauty, but only about 1,300 people. The percentage of elderly is about 49%. This means one of two people is elderly. There are a few children because young people go to a city to study or work and they seldom return. Onomi has a decreasing birthrate and aging population but people are fighting to keep Onomi alive. One way is through special products such as Onomi rice. This rice is grown by 6 farmers called “Onomi Ecology Farmers”. Begun in 2006, they researched a land and water and established their own standards. They use only half the amount of agricultural chemicals allowed by the prefecture. They sell this product at events, in markets and a restaurant in Kure, Nakatosa town. They also sell it on internet. The rice is very delicious because it grown according to their special policy. Onomi rice became a popular by word of mouth. 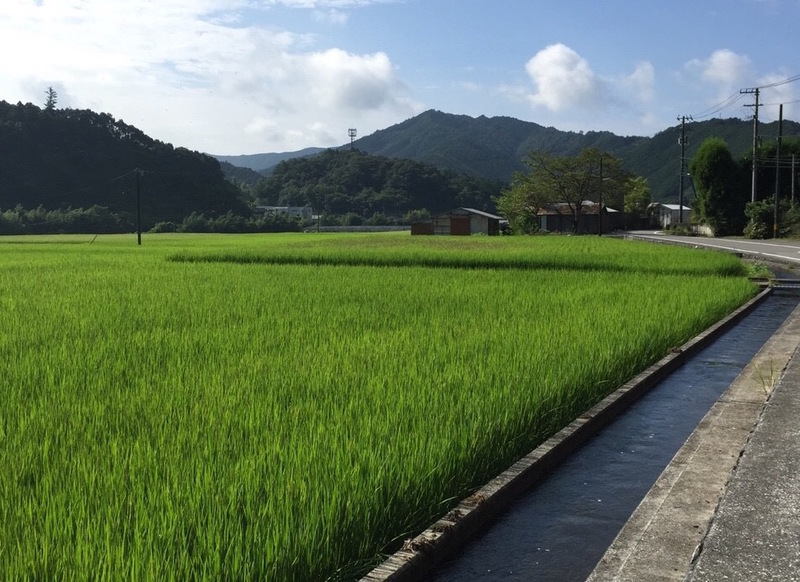 “Rice grown in a good environment is so delicious”, says Kazue Shimomoto a member of the group. For the past four years they have worked with a group of students from University of Kochi; COME☆RISH. They plant seedlings and grow them together. They also produce doburoku, a variety of sake. Its name translates roughly to cloudy because of its appearance. It is about 14-17% alcohol by volume. “Doburoku is easy to drink because taste is refreshing. It is so nice”, one of the fans of Doburoku said. “You should drink it when you reach 20,” she said. Onomi has another popular product, it is a sauce for roast meat. In 1994, four women started to make for themselves. They studied to improve its taste and finally got a special blend in 2003. “We have a confidence in its taste so it is the best souvenir in Onomi”, Etsuko Yoshioka who is one of the member making this sauce said. At that time, there are only two kinds of souvenir of Onomi; tea and rice. So they put this sauce with rice. Then this sauce gradually were known and became popular. They use original materials so they have confidence of its taste. They get a lot of orders but they have a limit of number they can fill because they are only six people. They make it about 5 times and about 700 bottles for a year. “Making it is very interesting. And we can enjoy talking with friends so we don’t care its profit”, Etsuko said very happily. That is a place where they can enjoy making product, talking and sharing their recent condition of each other. “I think it is important to save this taste and continue to selling it for a souvenir of Onomi”, Etsuko strongly said. Onomi is a very small village in Kochi but there are nice people who are fighting to make products keep Onomi alive. Could Chozaemon have imagined that the place he found work became a wonderful village 1000 years later, with very nice people living producing popular products? Nowadays they are finally recognized their activity. But their worry is that they are all elderly. They want to continue to make nice products in the future but there are few younger farmer in Onomi. In fact, almost all children in Onomi don’t be a farmer. Children find their dream when they go out of hometown to go to school. Compare with the past, we don’t be forced to be a farmer by parents so we can choose any job we want. Therefore farmer in Onomi gradually decrease. “We are wondering how we can continue this activity,” Kazue said in a small voice. I didn’t know this place! How nice the people try to create and sell new products and they make the place famous. The aging problem is really hard to solve. I hope people return to Kochi and work for Kochi. In something making processes, profits are designing the most parts. But they said that they just don’t care about the profits. So what would they want to gain? We see things like how they could bring profits for us.. Profits are not just about money. It could be everything. But I wondered what is their profits? I think using original materials in Onimi is the good way to become Onimi active. And I really like this quote, “Making it is very interesting. And we can enjoy talking with friends so we don’t care its profit” Because they are happy to do something with local people. At first, I thought this I would be a story about some famous people in history. Actually, this is about some people will live in history. Onomi will live because they are live there. First, I understand the meaning of Onomi which has deepest feeling of the Chozaemon who foud this place. Actually, decreasing of population is affecting everywhere. When I went to Umazimura they also worried about future. It was good to know how tgey actually said through tge quotes. I like this way of writing. I have never tasted the sauce even in living Kochi more than a year. Before I ate the rice from Onomi. It was really good. Therefore I think other products from there must be great. I would like to try them.